What is the OLED technology all about? 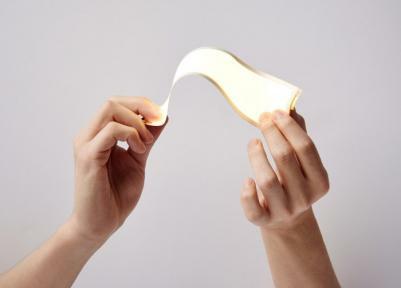 OLED panels are made from organic materials that emit light when electricity is applied through them. Since OLEDs do not require a backlight and filters (like LCD displays do), they are more efficient, simpler to make, and much thinner - and in fact can be made flexible and even rollable. OLEDs have a great picture quality - brilliant colors, infinite contrast, fast response rate and wide viewing angles. OLEDs can also be used to make OLED lighting - thin, efficient and without any bad metals. You can read more about OLED displays their advantages in our OLED introduction page. The main component in an OLED display is the OLED emitter - an organic (carbon-based) material that emits light when electricity is applied. 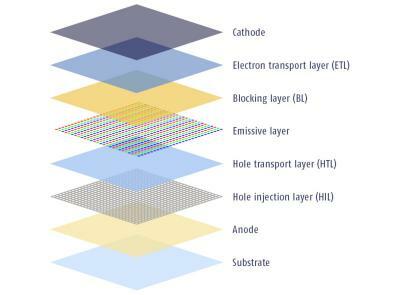 The basic structure of an OLED is an emissive layer sandwiched between a cathode (which injects electrons) and an anode (which removes electrons). Modern OLED devices use many more layers in order to make them more efficient and durable, but the basic functionality remains the same. An OLED panel itself is made from a substrate, backplane (electronics - the driver), frontplane (the organic materials and electrodes as explained above) and an encapsulation layer. OLEDs are very sensitive to oxygen and moisture and so the encapsulation layer is critical. The substrate and backplane of an OLED display are similar to those of an LCD display, but the front plane deposition is unique to OLEDs. There are several ways to deposit and pattern the organic layers. Currently most OLED displays are made using vacuum evaporation, using a Shadow Mask (FMM, Fine Metal Mask) to pattern. This is a relatively simple method but it is inefficient (a lot of material is wasted) and very difficult to scale up to large substrates. Some OLED materials are soluble, and these can be deposited using printing methods - mostly ink-jet printing. OLED makers hope that ink-jet printing may be a scalable, efficient and cheap way to deposit OLEDs. These terms relate to the driving method of the OLED display. A PMOLED (Passive-Matrix OLED) is limited in size and resolution (usually maximum resolution is around 128x128), but is cheaper and easier to make compared to an AMOLED (which uses an Active-Matrix). 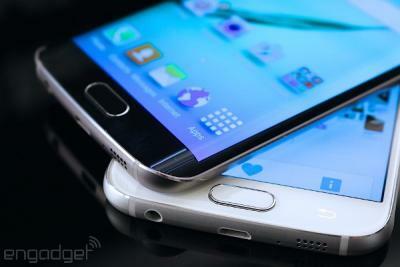 An AMOLED uses an active-matrix TFT array and storage capacitors. While these displays are more efficient and can be made large, they are also more complicated to make. PMOLED displays are used in small devices or secondary displays while AMOLEDs are used in smartphones, tablets and TVs. Here's more information about the difference between PMOLED and AMOLED. The leading AMOLED producer today is Samsung, who's making over 400 million displays a year, mostly smartphone-sized AMOLEDs (flexible and rigid). LG Display is the world's leading (and only) OLED TV panel maker, and LG is also starting now to produce small-sized flexible OLEDs. Besides Samsung and LG, there are several other display makers (including BOE, AUO, Everdisplay, Tianma and more) that are starting to mass produce small-sized OLED displays. You can see a list of gadgets with OLEDs here. In the OLED lighting market, several companies (including as OLEDWorks/Philips, LG Display and Konica Minolta) are already shipping OLED panels, but production capacity is still low and prices are very high. OLED lighting today is mostly used in premium lighting fixtures and installations and massive investments in production capacity will have to be made for prices to drop and for OLEDs to be able to compete with LED lighting.